Allows you to edit tags and poster images of mp4 files. Preview of poster look "like Explorer"
This software is not secure/stable so use it on your own risk. This folder is created in the begging of processing and is automatically deleted after processing. Poster preview might not exactly match Explorer preview. Explorer and other applications usually require some time to refresh displayed posters and tags. Baka Tagger does not extract existing posters or tags.
" quotes in tags are not supported. Recommended poster size is 256x256 or 1024x1024. 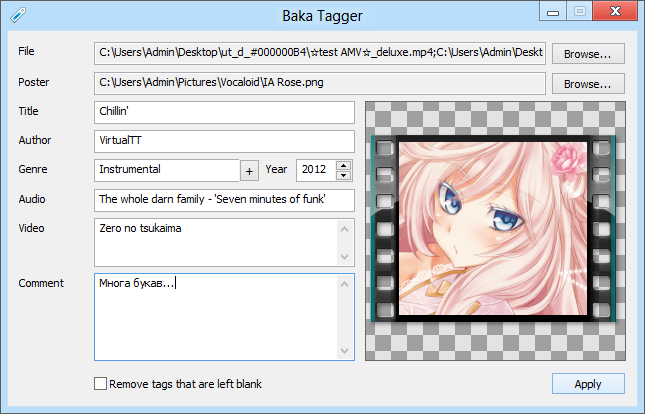 v1.0.4 update contains general improvements: Baka Tagger became smaller, faster and more stable.